What does the species look like? 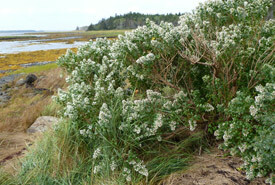 Eastern baccharis is a salt marsh shrub and, in Canada, measures around one to three metres tall. Large individual plants can reach diameters of up to 10 centimetres. This deciduous shrub has grey-green leaves. Different flowers grow on the plant depending on its gender, and bloom in late summer and early fall. Female plants, which can produce more than one million seeds per year, are easily identified by small white bristles that form on the seeds of the plant. Where is this species found? This species is rare in Canada, occurring only along a 25-kilometre area in southwest Nova Scotia. It is limited to upper salt marsh areas within harbours or bays that are well-protected from wind and waves. What is this species’ conservation status? 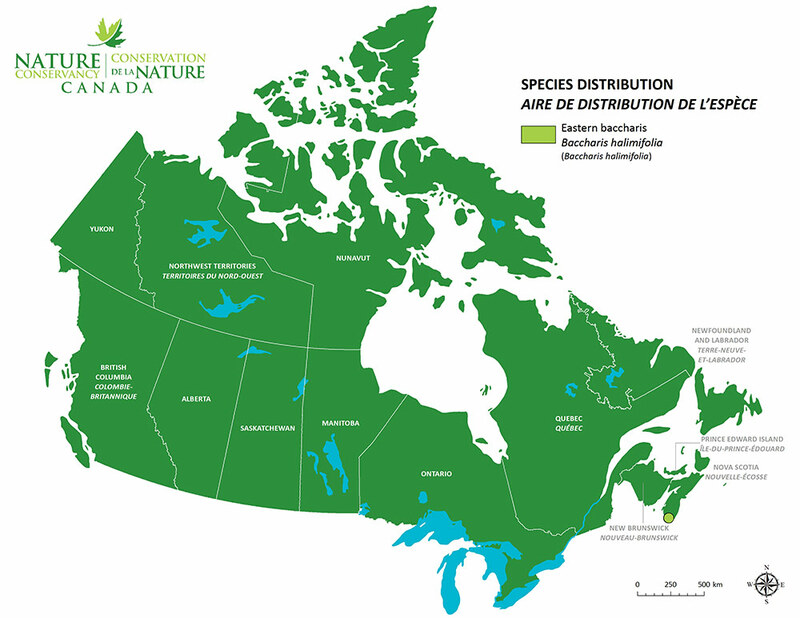 Eastern baccharis is listed as threatened under the Canadian Species at Risk Act and is designated as threatened by the Committee on the Status of Endangered Wildlife in Canada. In Nova Scotia, the species is at the most northern point of its range; however, it is found along the eastern and southern coast of the United States. It is expected that the effects of climate change, such as rising sea levels, will cause habitat loss and degradation for this species. What is NCC doing for the species? The Nature Conservancy of Canada (NCC) has announced a significant conservation effort in Lobster Bay, Yarmouth County, in Nova Scotia. We have conserved a 61-acre (25-hectare) island that contains or supports habitat for a large population of the nationally rare eastern baccharis. NCC’s newly protected island provides critical salt marsh habitat for the eastern baccharis. Approximately 1,500 of these shrubs, about half of Canada’s total population, can be found in Lobster Bay.